Initially, found this piece quite difficult to engage with. I have a strong personal connection to and academic interest in tradition, ritual and religion in Asia. As Nine Songs got underway, I felt strongly that I held a very different level of knowledge about the subject matter Lin Hwai-Min addresses in the piece in comparison to the majority of the Sadler’s Wells audience on Friday night. What I found most difficult about Nine Songs was the generalising way it seemed to treat Asian folk religion across the board. The accompaniment was a set of mainly religious songs or chants from various different cultural sources, which served to group a whole range of completely different civilisations as one, simply because they’re all “Asian”. In fairness, the source material – an ancient cycle of poems, also called Nine Songs – tells of how the Gods lead all the gullible humans astray. So I can see where the slightly critical standpoint springs from, and Lin is true to his source. However, the moments in which a reductionist version of traditional ritual is served up to a Western audience put forward a simplified version of Eastern religion to a largely unwitting audience. It felt a little too close to the fascination with the Orientalist “other” in which an audience is desperate to consume the “culture” because it’s different, exotic. I hate to think about the proportion of British Theatre-going public (what some might consider a group somewhat more educated than your average crowd) who would take away some stereotypical view of what it means to come from a background still pervaded by folk religion as many modern Koreans do (there, I said it) or practice an religion unfamiliar to the British public, like Buddhism. Perhaps it best not to think about it, and just enjoy the dancing and beautiful designs… That’s exactly what I said to myself in the interval. I pulled myself around, and enjoyed the second half a lot more than the first. 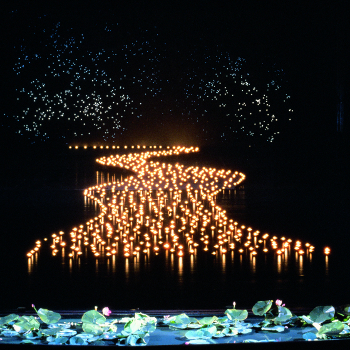 The river of lights honouring the dead in the final scene was utterly heartbreaking – it really brought home how strong a group of individuals can be when they work together, rather than relying on the power of the almighty gods… So Lin had a fair point really. Follow the link in the title to read my full review. Previous PostValentine’s Day… (this is not a rant)Next PostIs casual racism ok if it’s making a valid point?